Things that come in sets of four seem to really create a finished look. Think of your dining room table with four chairs, or a set of coasters. Even silverware typically comes in sets of four, forever reinstating the idea of the American perfect nuclear family, which is a family of four. So then why, when buying accessories for your motorcycle, are things typically sold in pairs? Mirrors, especially, could benefit from being sold in sets of four, as you can never have too many. Tires could be sold in sets of four to promote good tire rotation habits, and turn signals should be sold in sets of four to create a uniform look that's sleek and stylish. Well, it seems as though KapscoMoto finally heard my cries. 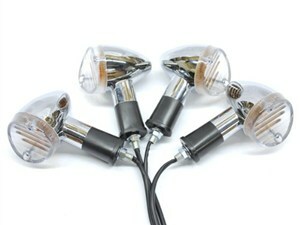 This set of Chrome Mini Clear Bullet turn signals comes in an economically priced, conveniently packaged set of four. Now you can replace your OEM (possibly ugly) signals with ones that will look as good as they work. These fit all metric applications and are very universal. The clear lenses are contrasted with the ultra bright amber bulbs that are sure to get your turning motives noticed by others. These guys will bolt right on too; no modification is needed. The only down side is that these signals only have two wires to attach, so you won't be able to wire up extra running lights with them.